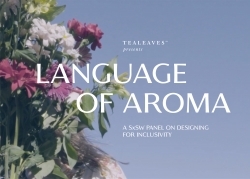 Austin, TX, February 25, 2019 --(PR.com)-- The luxury tea blender of choice for five-star hotels and Michelin chefs worldwide, TEALEAVES, to host The Language of Aroma: Designing for Inclusivity at the 2019 South by Southwest (SXSW) Conference and Festivals on March 10th, at the JW Marriott Salon 6 from 11am to 12pm CST. “Aroma takes us to new heights. It gives depth and memory to experiences that would not be the same in its absence. Any great chef or wine maker would by far agree that aroma plays such a critical role in what they do - but how do you convey that level of excellence to someone with a temporary or permanent inability to smell? It was then that we realized that aroma could really be seen as an issue of inclusive design and embarked on an exploration of with the leading minds in culinary, technology, branding and accessibility to understand how to better share this added dimension with all,” says TEALEAVES CEO Lana Sutherland on the inception of the project.